Better late than never… The Welsh Governent has finally published the TrawsCymru review they commissioned Dr Victoria Winckler of the Bevan Foundation think tank to produce. The report contains some good recomendations, for example pointing out the need for improved facilities at bus stations. It also states that ideally the journey time for TrawsCymru services should be no more than 33% slower than by car, and never more than 50% slower. That ties in with what I have been saying about the Aberystwyth – Cardigan route (X50 versus 550). The X50 is arround about the 33% mark, the 550 takes 1h 54mins. It wasn’t included in the review, but that’s 84% slower than the car journey time for Cardigan – Aberystwyth given in the review report (via New Quay but not Aberporth would be 61% slower than the car). When it came to the details, Dr Winckler appears to have forgotten her general recomendations. Included is support for the T9 (Cardiff Airport Express) service and the T(C)5 (the proposed 412 + X50 combination service). In my view the T9 is out because, at arround 10 miles, it is hardly long-distance. Also, to be pedantic Cardiff Airport is not a community. The problem with the TC5 is time. Like the 550, this route was not featured in the journey time comparison table published in the review. I’ve estimated the car journey time from Cardigan to Haverfordwest at arround 40 minutes. 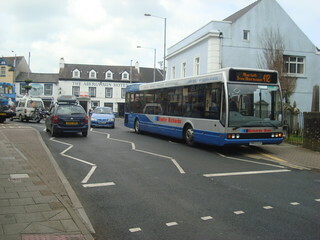 The 412 bus service, which would be part of the TC5, goes via Fishguard. Therefore, it does Cardigan – Haverfordwest in 1hr 27mins or 1hr 19mins, depending on whether the trip you happen to be on makes the additional detour to Trecwn. If you thought the 550 was bad at 84% slower than the car, the 412 will give you nightmares. On the faster trips, it is 98% slower than the car. The even slower journeys (via Trecwn) take 118% longer than the car. EDIT: updated URL to Winckler to point to a local mirror, since the Welsh Government have moved or removed the report. Two items on the BBC news last night (4th Feb 2014) about roads. The first, on the national news, was talking about damage the weather is causing to roads and shortage of funds to repair them. The report even went as far as saying councils may end up having to close rural roads due to having no money to repair them. After that, the local news (Wales Today) was reporting an accident on the M4 near Brynglas tunnels. Statements followed from users of the M4 calling for a relief road to be built urgently. The Welsh Government’s recently proposed second motorway round Newport was mentioned, with a price tag of around £1bn. In my opinion, that would be yet another inexcusable misuse of public money, encouraging use of modes of transport (car and lorry) which we are supposed to be moving away from in attempts to put a stop to climate change. Meanwhile, one of the Welsh Government’s pet transport schemes, adding a fourth lane to parts of the heads of the valleys A-road to make it completely dual-carriageway (at a cost of at least £600m), is still going on. Elsewhere, there are plans to accelerate A-roads in Pembrokeshire, including building miles of brand new road from St. Clears to Red Roses on the route to Pembroke Dock. Paul Davies, AM for north Pembrokeshire, is even calling for converting the A40 from St. Clears to Haverfordwest to dual carriageway. Such schemes are just going to magnify the time advantage road has over rail in south-west Wales (more on that in a future post), encouraging more car use and less train travel. Returning to that first news item, shortage of money is threatening closure of existing roads which the councils cannot afford to repair. If we don’t have enough money to maintain the existing road network, why are our elected leaders so keen on throwing money at new roads to encourage, and provide for, increased car use? Scrap the second M4 proposal, axe the heads of the valleys dualing project, forget the proposed new St. Clears – Red Roses route and don’t let Mr Davies get his A40 dualing proposal off the ground. Then, divert all that money (or some of it, with the rest used for public transport or moved away from transport altogether) to maintaining our existing road network.